Eden Hunt, a world-famous archaeologist, has received a call from a mysterious man, inviting her on a fantastic treasure hunt! Find the ancient treasure of Akua to win a huge sum of money, and finance Eden’s future adventures. Take on the other competitors head-on as you track down the hidden treasure. 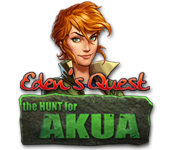 Eden’s Quest – The Hunt for Akua takes you around the world on an exciting Adventure! Find the treasure of Akua! Puzzle your way through saving Ancient Egypt. Journey into the Nightmare Realm and save Emily from an imaginary world that has been taken over by darkness!